Quit the hair fight that you regularly get into! Your hair is a part of your body that needs gentle touch and hair-friendly products such as a good shampoo and conditioner. – Use heat very frequently on their hair such as electric rollers and straightners etc. – Use chemicals regulary on their hair such as bleaching hair colors, highlights and streaks etc. – Use shampoo and other hair products that do not suit their hair type and end up producing more damage in the form of rough hair, dry scalp and split ends. – Comb or brush their hair for too long and too many times in a day especially when just once or twice will suffice. – Leave their hair dry for a long time i.e. not oiling it frequently. This gives room to dandruff and frizzy hair which ultimately leads to fighting with hairs. – Are careless of their diet and eat junk food, too much coffee, tea and processed food. Eat healthy food. When a doctor or your mother tells you to eat fruit and vegetables regularly, she is usually right because there is hidden wisdom behind her advices. Fruits and vegetables contain zinc, magnesium and folic acid which are absolutely helpful for your hair. Fish contains vitamin E that is the most hair friendly vitamin. If you do not like fish, take other sea food or vitamin E capsules off and on. You can put an end to hair fight by giving rest to chemicals for a while. So what if you have a few gray hair? The world won’t come to an end if someone noticed or pointed out gray strands in your head. Give your hair some rest and oxygen. Let it breathe. Apply henna to hide the white hair because it is a natural chemical-free hair which, unlike chemicals, never damages your hair roots. Its main purpose is hair-coloring. 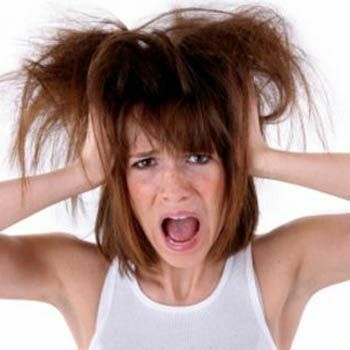 Do not comb your hair with a thin-teethed comb or sharp-bristled hairbrush. This damages your hair follicle making it weak and easily fallable. Use wide-toothed wooden comb and gently comb your hair twice or thrice a day, not anymore. Oil your hair with sesame or coconut hair – the two best hair oils that are hair-friendly and help make your hair longer and healthier. Wash your hair with a good shampoo every 2 – 3 days. Leaving your hair oiled or unwashed for too long results in hair-clogging as well which is the last thing you want if you are looking to quit the hair fight with the damaged and dull hair.